Tired of staring at your font collection, wondering what a trained graphic designer would do with all those typefaces? Unsure whether Times or Miller is the more appropriate choice for that vaguely left-leaning newspaper you have to design? Want to make sure that info-graphic you’re designing looks hot? 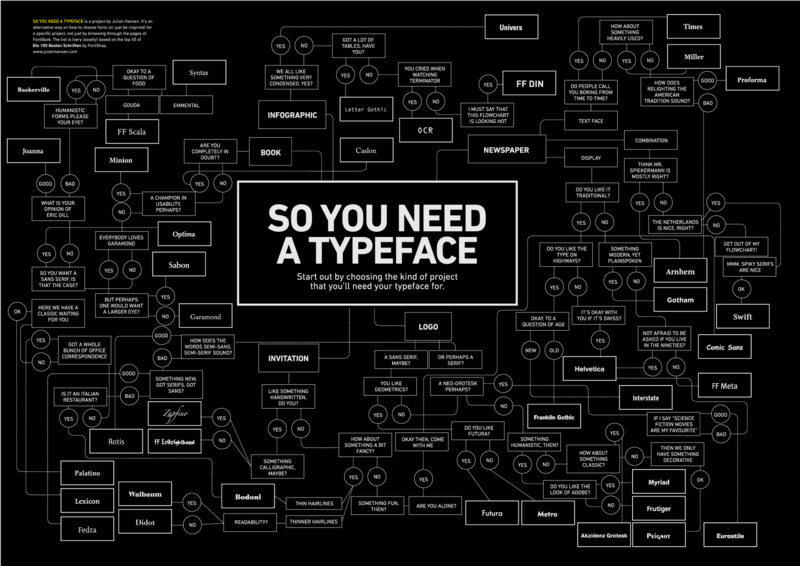 Then, friend, you need So You Need a Typeface, a large, hot-looking info-graphic suitable for printing and framing (or at least taping to the wall of your cubicle). From the good folks at Inspiration Lab. This entry was posted in Design, Fonts, Fun, Typography. Save this: https://www.zeldman.com/2010/09/28/designer-flow-chart-picks-typefaces-for-your-projects/.